Showing results for tags 'Night Fly Fishing'. I am writing a series of blog articles on this topic. I figured I would also post the information here as well. There are four articles total. The first two are done and I will post immediately. The other two I am working on finishing. I really like the blog I started writing for, but I noticed that my articles are lucky to get 200 views total. 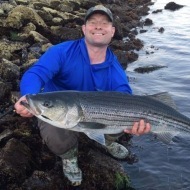 The whole point of writing the articles was to help people get information on how to fly fish at night more effectively for striped bass keeper size or better. I know that SOL is a more targeted audience and the information will be appreciated so figured I would share them here too.